Online ordering menu for YP Hello Asian Grill. 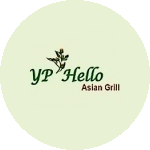 Come to YP Hello Asian Grill in Arvada, Colorado for Chinese, Vietnamese, Thai cuisine! A few of the items on our menu includes Pad Thai, Shrimp Rice Noodle Bowl, and Beef Drunken Noodles. Don't forget to try our Thai Curry! Find us north of McIlvoy Park by Old Towne Tavern. We're not far from the Arvada Centerplace Shopping Center. Order online for carryout or delivery!